Corsair has unveiled its Computex 2018 new product showcase, exhibiting a wide range of attractive PC accessories. In a trio of press releases sent HEXUS's way it details a pair of new MATX chassis, a quartet of new PSUs, its Vengeance RGB PRO Series DDR4 memory, and a special edition Obsidian PC Case. These appear to be 'small but perfectly formed' chassis aimed at enthusiasts. There are two variants, one with and one without the RGB frills (fans and controller), but other than that (and the price) they are identical. The main design feature is a left side segment with side, front and top tempered glass panels with a smaller sheet metal boxed segment to the right. Inside the Corsair Crystal 280X (RGB) MATX chassis you will find two front fans (RGB LL120 models in the colourful version). Elsewhere there is room for 2 x 120mm front, 2 x 140/120mm roof, 2 x 140/20mm floor. If you intend to go for liquid cooling you can fit a radiator up to 240mm front, up to 280/240mm roof, up to 240mm floor. For storage the Corsair Crystal 280X has capacity for 2 x 3.5-inch and 3x 2.5-inch drives. If you decide to fit a discrete GPU, cards up to 300mm long can be accommodated. You can opt to fit a Micro ATX or Mini-ITX motherboard. On the topic of dimensions, this chassis measures 280mm wide by 398mm deep by 351mm tall overall. 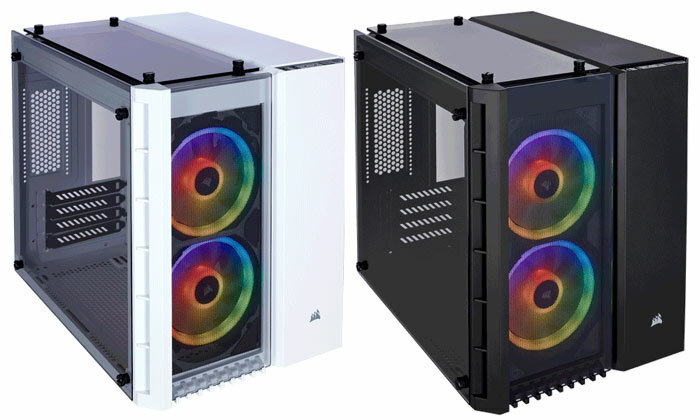 Both regular and RGB versions of this chassis are available now. They cost £99 and £149 respectively. Corsair has updated its iCUE software to unify dynamic lighting control, cooling control, system monitoring and command customization within a single intuitive interface. To celebrate this event it has launched its new Vengeance RGB PRO Series DDR4 memory and Obsidian Series 500D RGB SE PC Case. Both feature stunning individually controllable multi-zone RGB lighting. The particular new attraction with the Corsair Vengeance RGB PRO Series DDR4 is its multi-zone RGB lighting. Furthermore, users might be pleased to know that it is trivial to re-order or invert each module’s lighting via iCUE to make sure your system RAM looks its best. Corair's XMP 2.0 compatible memory is available in speeds up to 4,600MHz in black or white base colours. Example prices are; a 16GB 2666MHz CL16 kit for £175, and a 64GB 3600MHz CL18 kit for £840. If you Corsair Obsidian Series 500D (reviewed by HEXUS in Feb) but thought it lacking in the RGB department you might welcome the Obsidian Series 500D RGB SE mid tower chassis. The key differentiator is of course its pre-installed 3 x LL120 RGB fans (for a total of 48 RGB LEDs) plus Corsair Commander PRO Digital RGB Lighting and Fan Controller. Expect to pay $250 plus tax (£230 in the UK). Four new PSUs are being shown off by Corsair at Computex 2018. The new models are the small form factor SF Series 80 PLUS Platinum in 600W and 450W, and the Vengeance Series 80 PLUS Silver ATX PSUs in 650W and 750W. Please head on over to the respective links to find more about these new products. That looks like a usable case for a Disco. It's actually pretty nice, once you get rid of the RGB fans.